Washed up Indians center fielder Grady Sizemore was just put on the disabled list following surgery for a "sports hernia". This news came as a bit of a surprise to those of us masochists who follow the Tribe because press releases last week indicated that Sizemore would be out of action for a few days due to a "bruised knee" sustained while running the bases. Apparently, he had also been suffering from groin pain and his doctors felt that, as long as he was going to be out with a knee injury, he might as well undergo the procedure on the groin. Sizemore hasn't played a full season of baseball since 2009. He had microfracture knee surgery last Spring. He was batting in the .230's and striking out every three trips to the plate this year. The guy is clearly going to pieces. I feel bad for him. But sports hernia? I hope to God Sizemore isn't thinking this is going to help him rediscover the art of actually making contact with the baseball. The sports hernia craze is nothing short of amazing. It truly amazes me that such a procedure is being done so commonly on world class athletes. I've read the literature. I've done the research. And I still have no clear idea what a "sports hernia" is. I've read that it is everything from a "weakness" or a "bulge" in the inguinal floor, to a torn adductor muscle, to an entrapment of the obdurator nerve. What is it? Is it simply a Syndrome of Pathology? Is it multifactorial? And what exactly is being done in the operating room? It sounds like most of these repairs involve placing a synthetic polypropylene mesh in the inguinal area, either via an anterior Lichtenstein approach or a laparoscopic, preperitoneally placed mesh in the Space of Retzius. I found one randomized trial on PubMed comparing conservative therapy with laparoscopic surgery. The mystery and lack of uniformity surrounding the technique certainly raises a few questions. The mesh repair seems a little dubious to me. In true hernia repairs, the mesh acts as scaffolding, to allow natural scar tissue to form and strengthen the fascial defect. The mesh actually bridges the fascial defect. There are no anatomic fascial defects in the sports hernia. It's not clear to me, therefore, why exactly one needs to be implanting mesh in these patients. If you tear a muscle in your calf and I take you to the OR, stitch a piece of mesh over your muscle and tell you not to do anything strenuous for three months, there's a real good chance you'll feel pretty darn good after three months. But if you rest anything for 3-6 months, I suspect most will see significant improvement with or without surgery. 1) Someone write an expository paper with pictures or intra-operative video footage detailing the exact technique of the repair. 2) I would love to see a randomized controlled trial comparing a sham surgery with real surgery in patients who have experienced 6 months or more of refractory groin pain despite conservative management. If something like this demonstrated statistically significant improved outcomes, I could be persuaded that maybe, just maybe, sports hernia is a real live entity. One of my long time patients came to see me a while back with a complaint of abdominal distention, pain, and early satiety. A few years prior to this visit I had taken care of him during a prolonged bout of severe necrotizing gallstone pancreatitis. 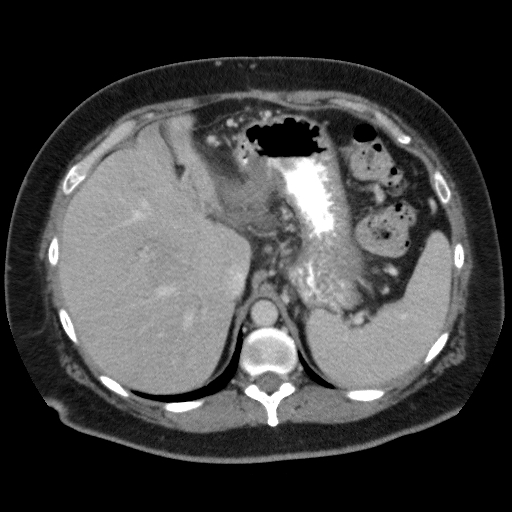 The scan above shows a giant pancreatic pseudocyst. A pseudocyst lacks a true epitheliazed wall. After an episode of severe pancreatitis involving parenchymal destruction and damage to branches of the pancreatic duct, pancreatic juices leak out into the surrounding retroperitoneal tissues. 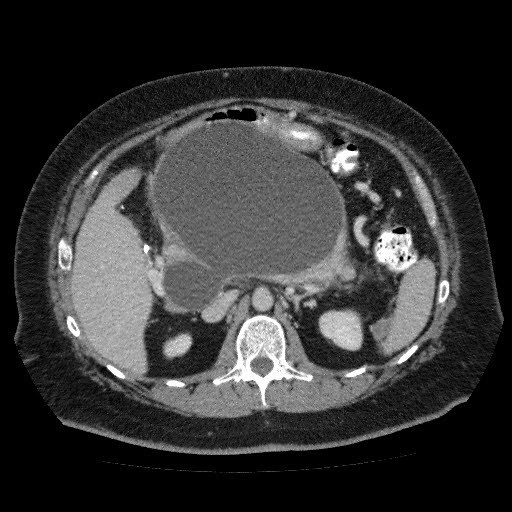 Once the flow of pancreatic secretions is tamponaded off (the ultimate size of the cyst is a function of the degree of ductal damage or obstruction) it will organize itself into a discrete cystic collection. Symptoms generally arise due to the mass effect of the cyst. Pseudocysts can also become superinfected leading to sepsis. Pseudocyst rupture is another rare complication. 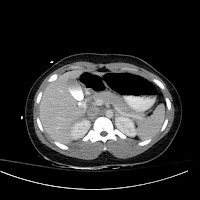 We usually adopt a stance of watchful waiting with regards to pancreatic pseudocysts. Most will spontaneously regress as the duct/parenchymal injuries heal. Those cysts that persist past 6-12 months are unlikely to ever go away. Furthermore, cyst size is predictive of regression--- those greater than 6cm are less likely spontaneously resolve. This cyst was over 20 cm. I watched it for a while but it never got smaller and his symptoms persisted. Treatment options include endoscopic vs. percutaneous vs. surgical decompression. Percutaneous drains are generally a poor choice because you simply convert a contained internal pancreatic fistula into an uncontained external fistula with all the attendant fluid/electrolyte sequelae. Endoscopic drainage of pseudocysts into the stomach utilizing endoscopic ultrasonography is an exciting new option but it isn't universally available and long term results are lacking. The standard treatment has long been surgical decompression of the cyst into either the stomach or small intestine. I performed a cystogastrostomy on this patient. It's a nifty little procedure. By the time you operate the cyst wall has densely adhered to the posterior wall of the stomach. So all you do is open up the stomach anteriorly, palpate the bulging cyst through the posterior wall and excise a wedge of the gastric/pseudocyst confluence. Classic teaching is to send off that specimen to the path lab to rule out a neoplastic process. The image below represents the 3 month follow-up appearance of the upper abdomen.